Also serving communities of Erlanger. There are 16 Assisted Living Facilities in the Florence area, with 5 in Florence and 11 nearby. The average cost of assisted living in Florence is $3,057 per month. This is lower than the national median of $3,346. To help you with your search, browse the 99 reviews below for assisted living facilities in Florence. On average, consumers rate assisted living in Florence 4.3 out of 5 stars. Better rated regions include Covington with an average rating of 4.3 out of 5 stars. Caring.com has helped thousands of families find high-quality senior care. To speak with one of our Family Advisors about assisted living options and costs in Florence, call (855) 863-8283. Florence, located in extreme northern Kentucky near Cincinnati, Ohio, is home to nearly 30,000 residents. The city is best known for its "Florence Y'all" water tower, a local landmark that can be seen from I-75/I-71. Seniors in Florence make up almost 15 percent of the population. There is good news for those in need of help with daily tasks: There are 15 assisted living facilities located in and around Florence. The Kentucky Department for Aging and Independent Living is charged with overseeing assisted living facilities in the state. The Florence, Kentucky area is home to world-class medical facilities including the St. Elizabeth Florence Hospital, in the event of medical emergencies or illness. Florence offers a pleasant climate for seniors. The city is known for its hot summers and mild winters, with an average January high temperature of 38 degrees Fahrenheit and an average July high temperature of 86 degrees. Florence has an array of community resources for seniors, including the Northern Kentucky Area on Aging, an organization that offers meals, wellness programs, counseling and transportation to seniors age 60 and older, as well as a senior center. Crime, particularly theft and property crime, is a major concern in Florence. While the overall crime rate in the city has decreased by eight percent in recent years, it is still 58 percent higher than the national average. This could be worrisome to seniors and their families. Florence is located directly on I-71/I-75 and I-275, which connects the city to Cincinnati, Ohio to the north and Lexington to the south. The Transit Authority of Northern Kentucky (TANK) provides regular, scheduled bus service within the city and between the city and other points in the county. Seniors (age 65 and older) ride for half fare. Seniors in Florence will find plenty of things to see and do in and around the city. Just a few of these include the Florence Nature Park and the the Florence Antique Mall and Turfway Park race track. Senior discounts are available at most attractions and events. Assisted Living costs in Florence start around $3,346 per month on average, while the nationwide average cost of assisted living is $4,000 per month, according to the latest figures from Genworth’s Cost of Care Survey. It’s important to note that assisted living rates in Florence and the surrounding suburbs can vary widely based on factors such as location, the level of care needed, apartment size and the types of amenities offered at each community. 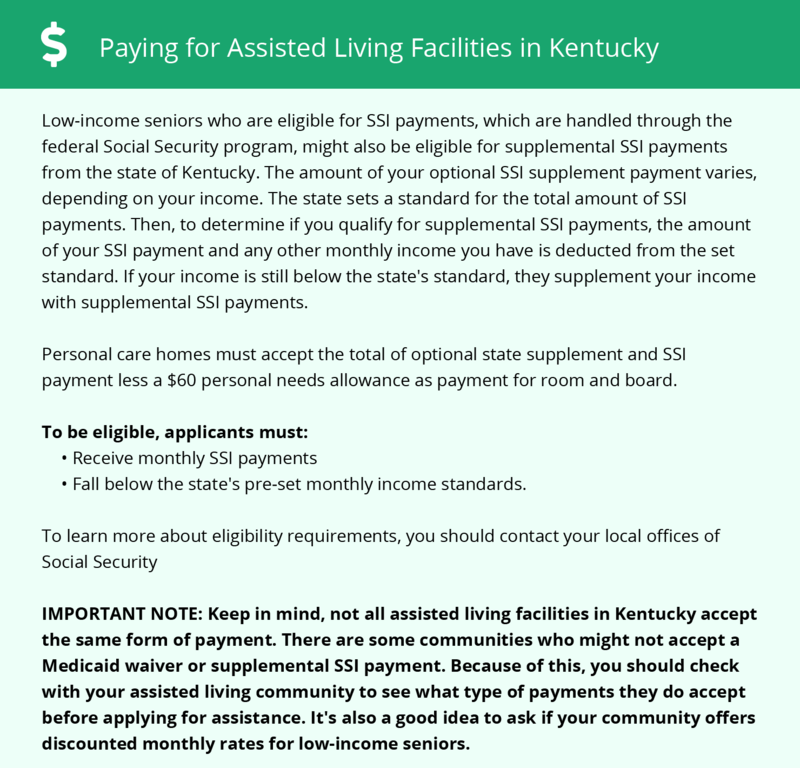 Supplemental Security Income Category G is one of several government assistance programs that are available to Florence, Kentucky seniors who meet the eligibility requirements. Learn more about these programs, plus who’s eligible, on our Assisted Living in Kentucky page. For more information about different ways to finance assisted living, visit our Assisted Living in Kentucky page. Florence and the surrounding area are home to numerous government agencies and non-profit organizations offering help for seniors searching for or currently residing in an assisted living community. These organizations can also provide assistance in a number of other eldercare services such as geriatric care management, elder law advice, estate planning, finding home care and health and wellness programs. To see a list of free assisted living resources in Florence, please visit our Assisted Living in Kentucky page. Florence-area assisted living communities must adhere to the comprehensive set of state laws and regulations that all assisted living communities in Kentucky are required to follow. Visit our Assisted Living in Kentucky page for more information about these laws.